Murray Hill is a fifty-seven acre estate known for one of the most stunning views in all of Loudoun County. Overlooking the Potomac River and Catoctin Mountain Range, the 18th century style home was built by the owner's grandparents, Mr. and Mrs. Stirling Murray Rust, and is listed on the National Register of Historic Landmarks and the Virginia Landmark Register. It is framed by mature oak trees, countiful gardens, rustic outbuildings and pastoral vistas which provide the perfect backdrop fo you special day. The home is open for guests to enjoy and has a treasure trove of antiques and memorabilia that lovers of local history will particularly enjoy. Murray Hill is a working farm with retired polo ponies and Black Angus cattle. The grand fountain and open pastures set the peaceful tone for the venue as they greet visitors passing though the tree lined entrance. Brides are amazed they are in such a tranquil setting and yet have the convenience of being 10 minutes from lodging and downtown Leesburg, and 25 minutes from Dulles airport. There are 5 locations on-site that ca be used by the bride to transition from one area of the estate to another as she visits with her guests. These options will have water access, power, and restrooms. The Grassy Bluff overlooking the Potomac is a magnificent location for a ceremony or cocktails. The River Terrace is often used for cocktails as are the Formal Gardens and the Secret Garden. If a guest passes through the Rose Arbor it will lead to the Secret Garden which is surrounded by walls of mature boxwood. The centerpiece of this garden is a large reflecting pool ~ the perfect spot to float candles or flowers ~ and to have cocktails. Murray Hill offers a multitude of options to adapt to your needs. Barn - 115' x 61' - Restored llama barn with kitchen and indoor restrooms which can accommodate 200 seated guests with room for buffet area and dancing. River Room - 25' x 35' - 60 people seated, more for a standing reception. This room has the best river view with drapes that close for video presentations. Dining Room - 14' x 19' - Board Meeting - 16 people seated, would handle overflow of 20 from a larger reception held in the living room or River Room. 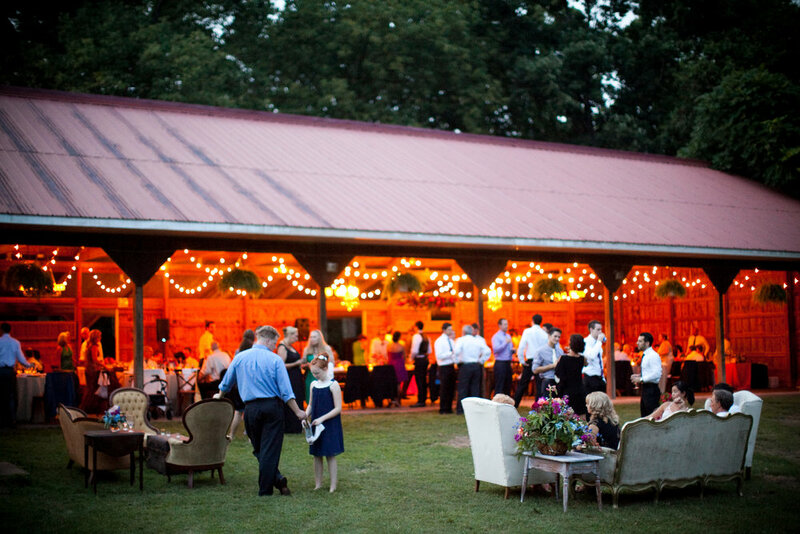 Screened Porch - 16' x 29' - 50 people for a seated event, more for a reception. Terrace - Slate terrace overlooks the river if needed for a reception for 60 or a seated dinner for 50. Poolside - An elegant poolside event suitable for 200 - 230 guests. Murray Hill is coach accessible and has ample onsite parking. Floral decorations can be designed by our staff. We welcome the opportunity to make all the necessary arrangements for you. Please contact us at your earliest convenience.